This is a breakfast sandwich that we grew up eating. 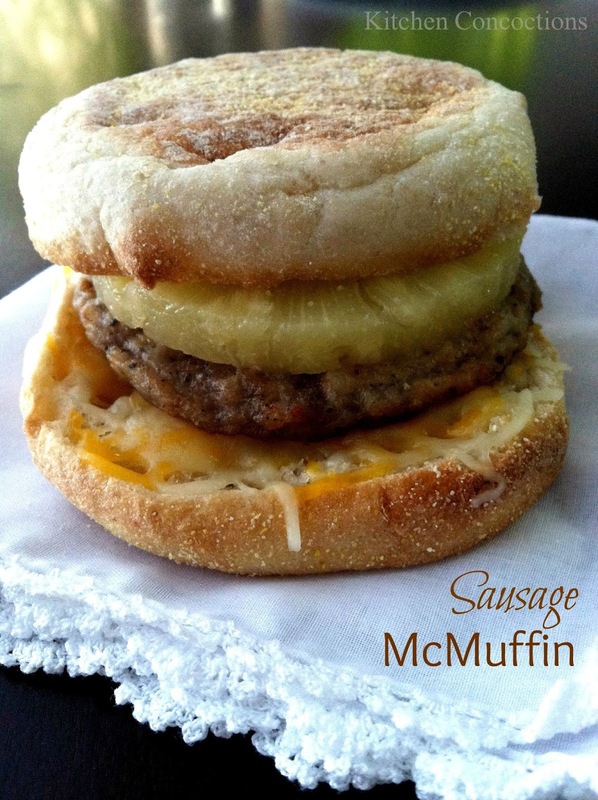 As children, we called them McMuffins, but that name is trademarked, so for this blog I will call it a Breakfast Muffin. My mom always served the sausage with pineapple rings, but you can use eggs instead, if you prefer. They are quick and filling! Heat the sausages according to the directions on the package. Cut in half and toast the English muffins or biscuits and toast until lightly brown and crisp. Assemble the McMuffins, putting a sausage patty and a pineapple ring on each, and topping with cheese. Preheat a pancake griddle to 350 F. When hot, Crack each egg onto the griddle, making individual “egg patties”. Break the yolks. Cook 3-5 minutes, until browned, and then flip. Continue cooking until this side is browned as well.Assemble the McMuffin as directed above.